This 2005 Ford F150 came in with the complaint that the turn signals would stop working whenever the headlights were turned on. The customer also stated that the a/c did not work. Inspection found that the turn signal indicators in the instrument cluster would would come on at about half brightness when ever the lights are turned on and if the a/c controls are used. Also the high beam indicator would illuminate similarly and the gauges would move as the switches were turned on and off. The turn signals worked normally with all other switches turned off. Following the wiring diagrams this ground point was located behind the right kick panel. 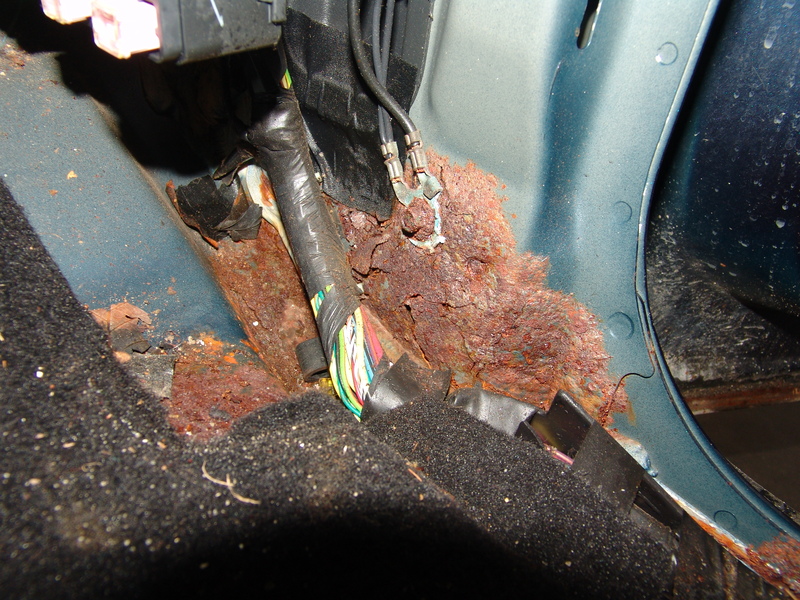 That is a lot of rust for the inside of a vehicle. It was so rusted that the metal let go as the attaching bolt was loosened. We had to use pliers to hold the rusted nut and an impact on the bolt head to break this loose. The bolt head wrung off during the process and left the terminals in tact. It did take a few minutes to separate and clean the individual ring terminals. Since there was no place to secure the terminals near the original location I pulled the end cover off of the dash panel and secured the wires as shown below. I did have to ream the hole out slightly in the ring terminal in order for the bolt to fit. We followed up with inspection and cleaning of a second ground point located behind the driver’s kick panel. The metal was in pretty good shape over there. After the ground was repaired all systems went back to working correctly. Some of the rust on the outside of the truck. I know that this amount of rust is very common in other parts of the country but it is almost unheard of here in South Carolina.